● Vera Bradley offers free shipping on orders which are $75 or more. 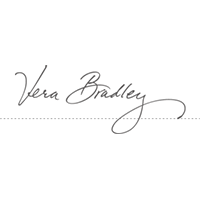 ● Vera Bradley usually offers an extra incentive to sign up for the newsletter–most recently $20 off one future purchase of at least $75. ● Every Wednesday Vera Bradley offers discounts on new products. ● Periodically, Vera Bradley offers extra savings on discounted items such as saving an extra 20% off items already on sale. Internationally recognized high fashion designer, Vera Bradley purses, bags, accessories, and jewelry are some of the most sought after pieces in the fashion community. Offering affordable luxury pieces to international customers all over the world, this designer produces new collections every three months (four major collections a year) and makes most of them available via the online store. At least two or three times a year they also offer exclusive collections that will only be made available (in limited quantities, no less) online, and once they are sold out of those pieces they are gone for good. Visitors should check back regularly or join their email newsletter to find out more about the special promotions. For most up to date offers check out Vera Bradley on Facebook and Twitter or contact Vera Bradley Support for any questions.